I’m often asked how long should you hold on to makeup products and when you should throw them out and I’m pretty sure we’re all guilty of hanging on to the odd eye shadow or mascara longer than we should but out of date products can do you more harm than good. Bacteria builds up in products the more you use them so by not throwing them away within the recommended time frame you can’t be sure what kind of negative effects they might have on your skin. Mascara’s in particular have the shortest shelf life especially if it’s one you use regularly. The easiest way to tell is if the “popping” sound is gone. The more you use a mascara the more air is trapped inside the container so it will dry up quicker. This means it’s time for a new one. With foundations you will be able to tell if they have started to separate or just don’t have look right. Try keep your foundation away from heat as this is an environment that bacteria just loves! 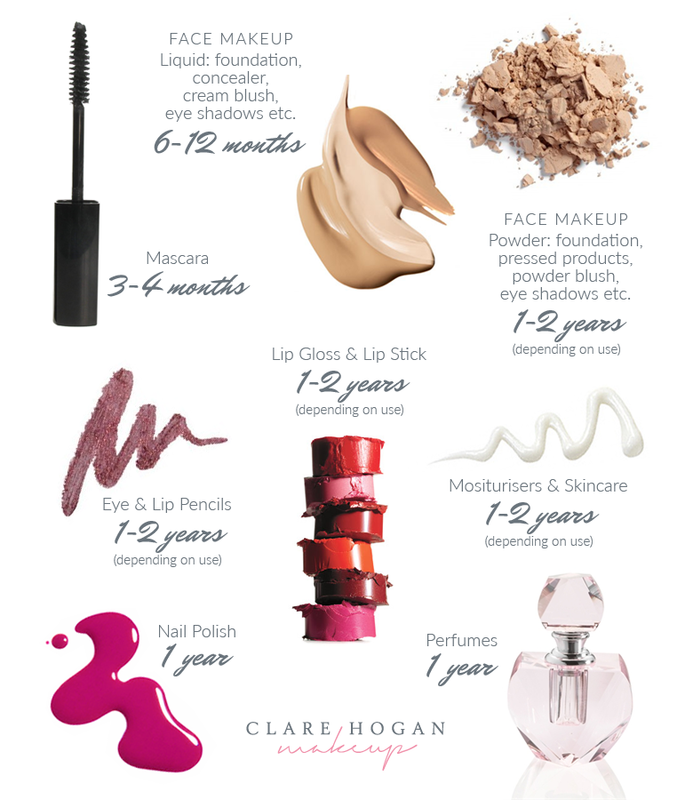 With concealers, powder and stick products can last up to 2 years but liquid formulas have a shorter shelf life. Again the colour and consistency will be a giveaway. Powders can be a little harder to tell especially loose ones but with a powder whether it be blush, eye shadows or other face powders, you are continually putting your brush or puff into the pot so this is transferring oil and residue from your face back into the product so this is where washing your brushes is very important. With pressed powders you might see a skin form, this is the oil from you face or eyelids effecting the product so you can remove the top layer of product to reveal fresh powder below. For eye and lip pencils you should pair them with a good sharpener to refresh them regularly. You can tell they have gone off when they start to form a film on the nib. You do need to be very careful with eyeliners as you are applying them to a very sensitive part of the face and if you use these too far beyond their expiry date you may end up with a nasty infection so just don’t risk it! Your favourite lipstick or lip gloss I’m sure will be used long before it reaches it’s shelf life but for those you only wear occasionally you really need to replace these after 2 years. If you’ve been sick or suffer from cold sores it’s a good idea to replace them more regularly or you could use a lip brush which will stop direct contact. You’ll know your lipstick has gone off if it has gone hard and doesn’t apply properly. Everyone pretty well knows when these are gone off. They tend to go gloopy and harder to apply. So I hope this helps… now get that make-up bag and start sorting!